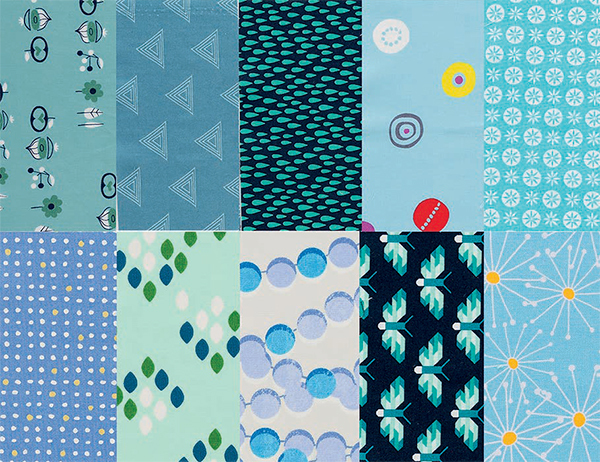 When it comes to choosing colors for a quilt—particularly a scrappy quilt—the task can feel a bit like flying by the seat of your patchwork pants! But believe it or not, choosing colors for a quilt that’s scrappy can be the best part of making one. 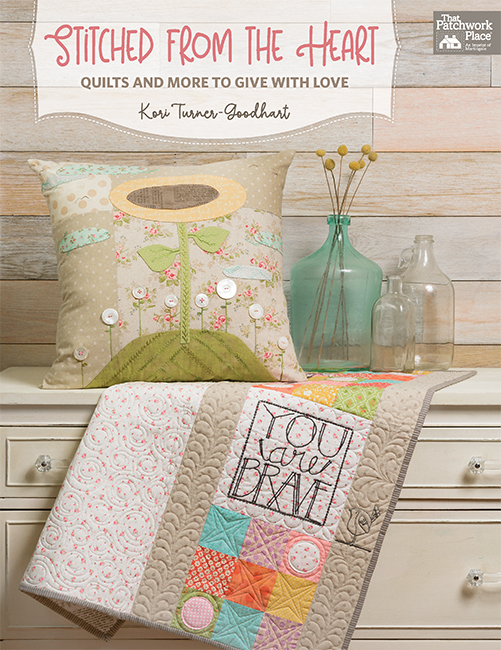 How does three-time Martingale author Kate Henderson choose her scrap-quilt colors? 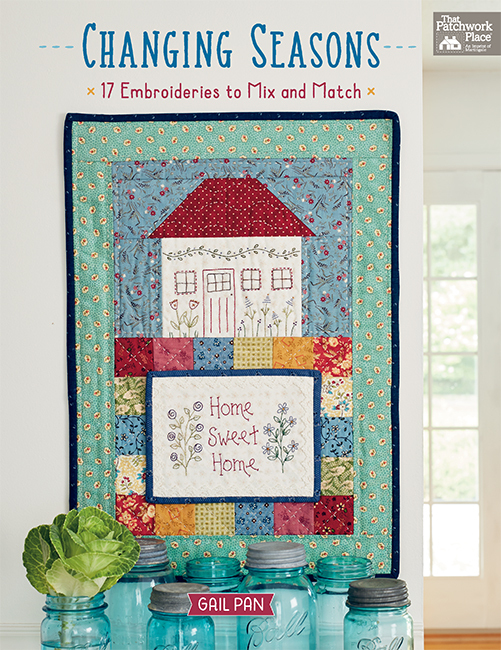 In her book Scrappy & Happy Quilts, she starts simple by using only two or three colors. Within those few colors, she goes wild with shades and prints. Why? Because fewer colors = less stress = more fun! 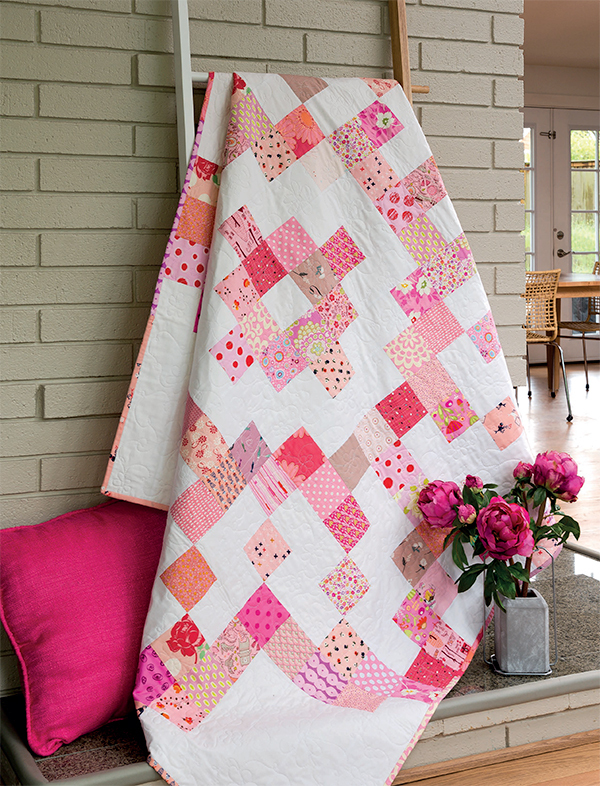 And if you already sort your stash by color, making one of Kate’s pretty and pretty-quick quilts is easier than ever. Today we’re sharing an excerpt about color from Kate’s latest book—because you can never have enough color confidence! Do you use any of the color tricks Kate uses? Read on to find out. One of the best parts of quiltmaking is choosing fabrics. 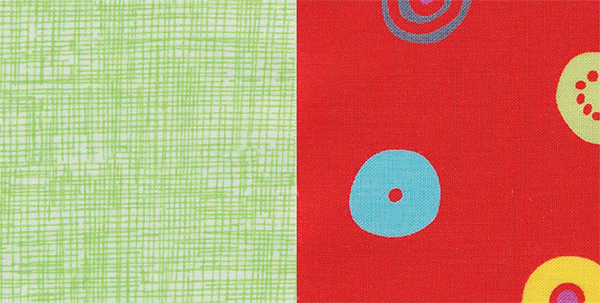 I love to spend an hour or two playing around with fabric, making piles of different color and print combinations. I’m no expert on color, but I know what I like and I’m not afraid to experiment with different combinations. Below you’ll find some of my ways of choosing quilt fabrics, but ultimately it’s up to you. If you like the fabrics and colors you’ve chosen, then they’re perfect! The background fabric you choose can dramatically change the look of your quilt. Solids, especially white or cream, are always a go-to option for me. I use a lot of bright colors, and a white background makes them pop. A really dark gray or navy can do the same thing. If you want something a little different for your background, low-volume fabrics are a good option. Low-volume fabrics read as light fabrics but at the same time have a secondary pattern or design. A low-volume fabric could be white, cream, or pale gray. From a distance, low-volume fabrics often read as solid, but up close they’re more interesting than a solid. Mountain Hiking uses low-volume fabrics as a background—the quilt gets more and more interesting as you zoom in! The majority of my stash is made up of prints, but my collection of solids is increasing. Most manufacturers have a range of solids that coordinate with their prints, and solids come in every color you could wish for. 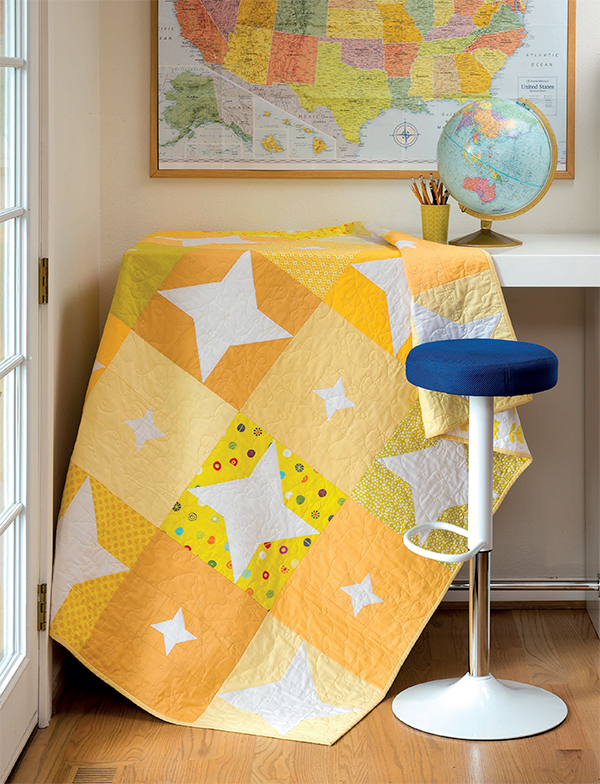 Solids mix perfectly with prints in a scrappy quilt, and they can also work as the main feature in a quilt. 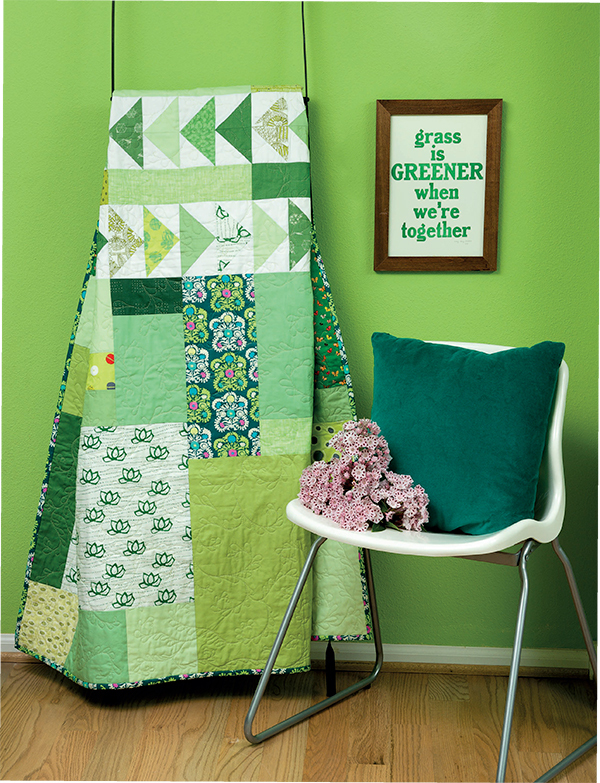 Fields of Green relies on a variety of large-sized scraps in solid shades and prints. Color schemes are logical combinations of colors on a color wheel. 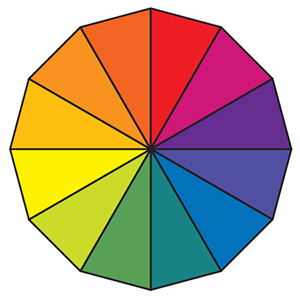 A color wheel is a helpful tool for determining color combinations that will work well together. A basic color scheme uses two colors that look appealing when paired. For a monotone color scheme, choose one color you like and add different shades and tints of that color. Add solids and prints that are darker and lighter. Then add brighter and more muted fabrics. The prints can be composed of many colors; they just need to read as your chosen color from a distance. If choosing colors and playing with different combinations fills you with dread, start by focusing on a monotone color scheme. Analogous colors are next to each other on the color wheel. For an analogous color scheme, first select fabrics of a single color. Then add two more colors, the ones that—on the color wheel—lie on either side of the first. 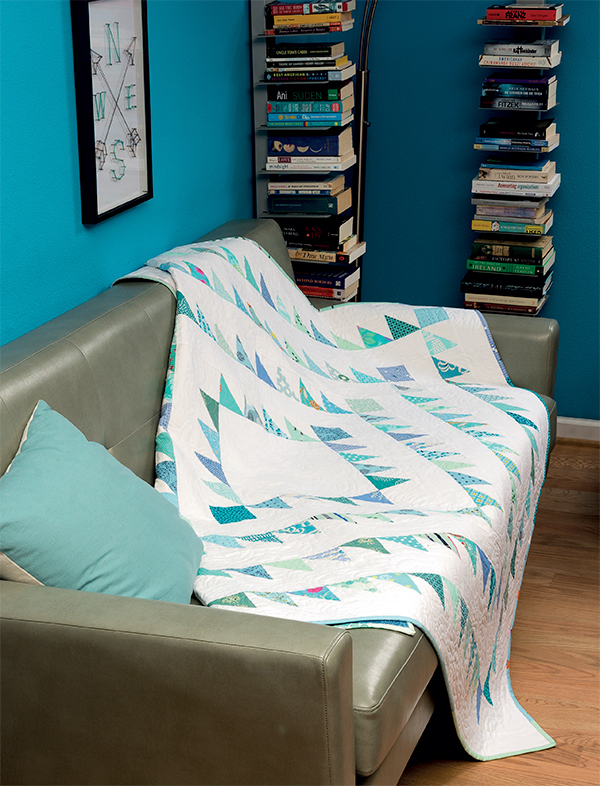 Because the colors blend together, quilts with analogous color schemes have a calming effect. The main color of the quilt is orange, and I included pops of blue to add interest. Choosing mint rather than a vibrant green calms down this complementary pairing. The first half of Scrappy & Happy Quilts features quilts with just two colors, and the second half has quilts that are three colors. Of course you can choose your favorite color and get sewing, but don’t forget to experiment with colors you don’t normally use, and also combine the unexpected to make each quilt your own. Happy quilting! Reading this post in email? Click here to view the video online [link]. 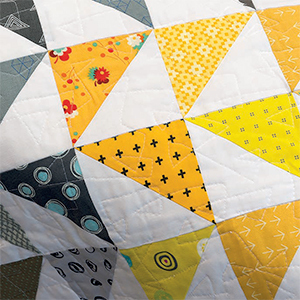 Sticking to just two or three colors for a scrap quilt is a surefire way to use up your scraps and create a beautiful scrappy quilt quickly. 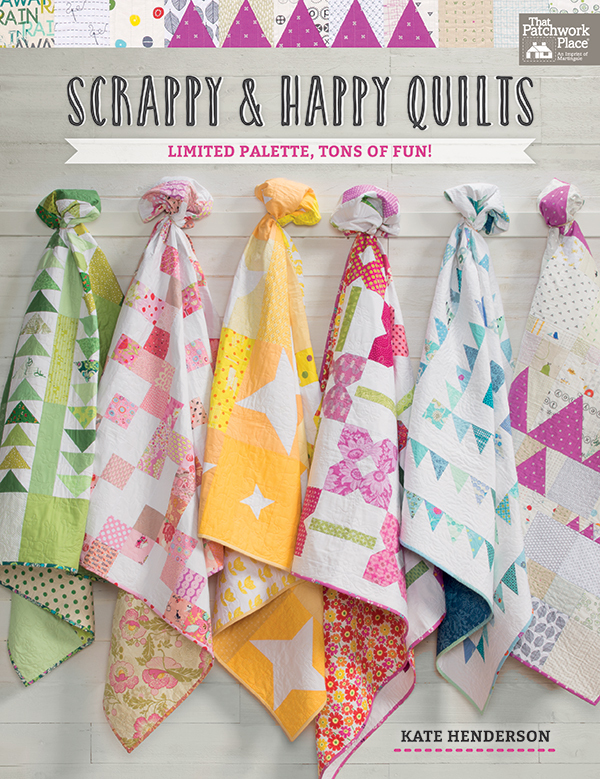 Take a look at a few of the fun quilts Kate’s designed for your scraps in Scrappy & Happy Quilts! Do yellow scraps shine in your stash? 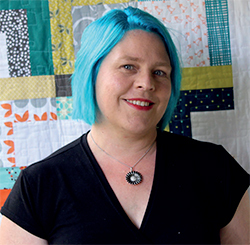 Whatever your signature color, Kate will lead you on your next scrappy journey with her super-fast, super-fun, super-scrappy quilts! 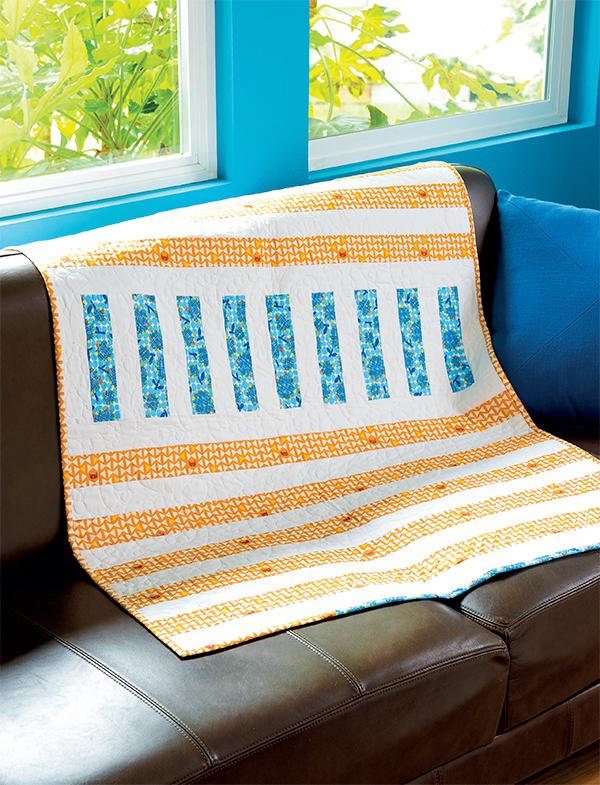 See more from Scrappy & Happy Quilts here. How do you typically go about choosing colors for a quilt that’s scrappy? I stick to two- or three-color quilts, just like Kate. I get an assist from the color wheel—it helps narrow down my choices. I pick up a scrap, pick up another, sew them together, and I’m on my way! Tell us your scrap-color tips in the comments! I approach scrappy projects in different ways. Sometimes I choose what colors I am going to work with, and then limit myself to shades, tones, etc of just those colors. I love the few quilts I made where the colors were low volume whites with shades of blues and purples. But my all-time favorite scrap quilt is the red and white one. I love red and white scrappy quilts. 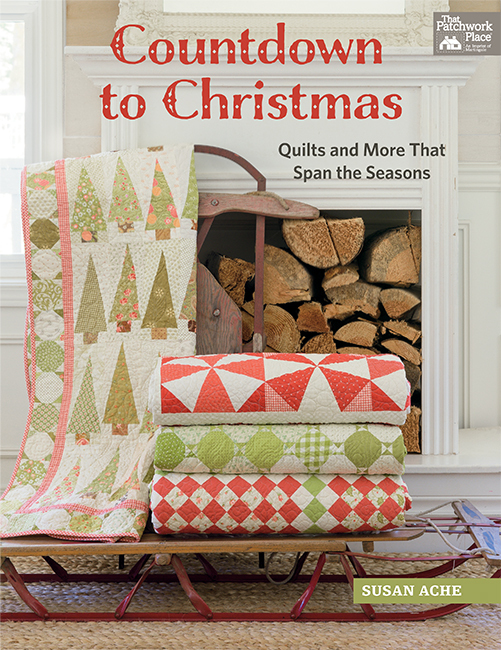 Put a red scrappy quilt on a cover and I am buying that publication! I’m afraid I’m a pick up one scrap, pick up another, sew them together and I’m on my way, type of gal. I really admire one color or color schemed scrappy quilts, but I guess I’m too lazy or busy to sort my scraps by color. I need to take several days and do this. When I do a scrap quilt they are usually the more the merrier. Value being the go to. Some if they call for a specific number of fat quarters, etc. I may do a controlled scrap. Scrap quilts are my favorite. I usually try for some kind of logic in my scrap quilts but mostly they are kind of random. I like these ideas though. Next time…. I sort my scraps and fabrics by color. I make a lot of one color quilts, but I use a large variety in the prints and values. Some color combination look more contemporary and others more country. If I want to use red and navy in a quilt and I want it to look more country, I use Dark Navy and turkey red. If I want it to be more contemporary I use a lighter shad of Navy and a crayola red. If a quilt has too much going on with the design or the main fabrics, I use white or off white solids to rest your eye. If you use small prints and lots of them for background it makes the design more chunky and more country. Scrappy quilts are my favorites and it takes longer to put the fabrics together than to piece, but that is where the creativity comes in. When people say you can put anything together in a scrap quilt I know they make ugly scrap quilts. When I make quilts for young people, I use brighter colors or pastels. I also use a lot of gray in the quilts for teens. They always seem to like that combination. I made a group of quilts for foster kids and used lots of yellow and gray prints and they were so cute. I use all my scraps in a scrap quilt. I must admit that I pull all my scraps out and select those scraps that talk to me. I have a ball working with all my scraps from me previously loved fabrics! I pull all my scraps together and use them, lights and darks and any color. I do use a particular fabric for background to tie it all together, but it is usually not a solid. However, it tends to be something that defines the scraps and show a design. For traditional quilts, I pick a main fabric & coordinate with it. With scrappy, it depends on the pattern. If the pattern is pretty much all over (difficult to see where block starts & stops) – I pick up a piece and sew; if it has an orderly observable block (like New York Beauty) I pick a piece for each block and coordinate with that piece. I decide the mood (warm,cool), the colors in the room (walls, sofa), etc. Then I sort the fabrics by light and dark and start sewing. For some scrap quilts I do limit my color selections. But for others I might be a bit more bold and pick up more of a variety of colors. Kate’s color selection tips are very helpful, and I will keep them in mind the next time I begin a scrap quilt. Her quilts are bright, cheery and very appealing. I start with a piece large enough to be cut into a number of pieces (squares or strips) and then choose colors that seem to go well with that framework plus a neutral background color. Arranging the pieces within the quilt is the challenge. I made one quilt that looks blinding even to me, but it’s so extraordinary that it makes some people say, "I like that wild one the best!" I usually don’t pick the colors…just use everything I have available! I stick to one or two colors and usually a solid background, mostly white. My color choices sometimes take longer than they should because normally a scrappy quilt turns out nice no mater what you throw in the mix. I like to throw in a bright, attention grabber fabric, or a really dark fabric, to make the other colors shine. If I’m feeling really risky, I will close my eyes and just pick from the shelf. When I am ready to do another scrap quilt I choose color by what I have the most of in my stash scraps. It is usually browns and blues with a dusting of red. I get an assist from the color wheel. Love the red rotary cutter. Scrappy is very hard for me, but I love them. The hardest is getting started. If I just pick a few colors, then I’m apt to stick with that, but if I just start putting things together, then I keep going. It drives me crazy at first, but then I just don’t think about it. Pretty soon, all is well and I have a quilt top!!! Normally, I do a true scrappy and any color goes, and love seeing the looks that come with all the variety. It all works. The current quilt I am doing, is a controlled scrappy, reds and pinks, various values, colors. It works too. I am liking this approach. I like controlled scrappy. I pick my color "theme" then go thru my scrap stash and pull anything within that range. Having a limited color palette makes the quilt more cohesive. I use whatever looks good to me. I’m learning to use a color wheel. I love her suggestions and quilts! Once again, "it depends". Most often, my scrap quilts are "scrap happy"–lots of scraps of all kinds. But occasionally I pull scraps in specific color ways, more closely defined, the way I would if I were shopping at a store. I’m more of a random-scrap quilter, tho I’ve been happy when I’ve decided on 2 or 3 colors and gone from there. I am a BIG fan of scrap quilts and have only ever made two that weren’t! Usually, I turn to my trusty color wheel, but I’m also open to just sewing scraps together. I generally give away the quilts I make from patterns. I keep scrap quilts because they remind who the others went to, & why I made it for them, whether it was a celebration of joy or for comfort in a sad situation. I usually sew scraps in a row or square and intersperse them with low volume fabrics. I haven’t tried your more controlled ideas, but I like them! I absolutely need this book! This one totally depends on the pattern and my mood. Sometimes anything goes and sometimes I am structured. I totally stress when picking colors for my quilts, but I love pulling fabrics and eliminating some (except for putting them back where they belong!). For scrap quilts I usually stay with 2 or 3 colors except when I’m working on a wild scrappy batik! I audition fabrics until I find a combination that looks good together. Love scrappy quilts. Sometimes I cut up perfectly good yardage to make it into scraps. I choose lots of different colors with a solid neutral background. I’ve got to try the theory of sticking to just a couple colors. I generally start with a print and pull colors from it. I like lots of different fabrics and colors in my truly scrappy quilts. Only get those by mixing up the shapes in a paper bag and living with what i pull out. When I have colors in separate piles on my work table, I find I start orchestrating the layout and end up with more of one color or pattern as I get close to the end of my quilt. I don’t like sticking scraps together willy-nilly, even if it is a "scrap quilt". I tend to stick to 2-3 colors! My scraps all live in a great big bin, or two–when I’m in a scrappy mood, I open a bin and go nuts. I have a general idea what main color scheme I want to be in the quilt, but then I add tons of colors from my scraps. Sometimes it is just the borders that tie it all together. Scrappy quilts are my favorite, but I do have stop and arrange the blocks in the end. It’s hard for me to be very scrappy. I tend to want to stay within a color scheme. My method of scrap quilting utilizes lots of fabrics carefully curated to play well with their neighbors. I have always thought that the more the merrier should apply to my quilts as well as my friends. I struggle with scrappy, so I haven’t completed a scrappy quilt yet (2 started). I think focusing on two colors would be easier, and more pleasing, to me. I just start picking out scraps and going with whatever I have. Since blue is my favorite color, my scraps will lend themselves to all shades of blue. I am pretty good at picking my colors,never go with what is used in the pattern.I want it to be mine! I go with left over scrapes colors and try to make something different with what is left. I usually stick to two or three colors, and use light, medium and dark within those colorways. I make a lot of Jelly roll Race/1600 quilts for charity–with strips pulled from my stash of (scrappy) 2 1/2 inch strips. The latest one I put together was browns, greens and grays. It will look great! I have done red and white, all shades of blues, pink with purple, and gold with greens. They all looked nice. I usually do three colors, a light, medium and dark fabrics for quilts that go together well. I start with a few ‘go-togethers’ – then add some colours that show up in those prints, then add a few more, then a few more. It ends up REALLY scrappy. My biggest problem is the background. I never have enough of the not-so-bold fabrics, like whites and creams etc. My other biggest problem is the size of the scraps. Most patterns call for bigger pieces – and I have LOTS of little tiny ones! I pick up a scrap, pick up another, sew them together. I usually don’t have enough of one color family to make a quilt in a single color family. It totally depends on the pattern and the fabric I am working with. One thing for sure I like color. Lots of color. The brighter the better. I mostley stick to 1 colour scheme, my latest is Purple/mauve discovered some pinks that fit in. Sometimes i choose a multicolor fabric and let that lead me to the colors i need. Sometimes I start just with scraps and start sewing them together, more random. I usually start with one or two colors and then choose a variety of shades, lay them out to see how they will work together. scrappy to me is whatever happens, happens as long as 2 of the same are not put together or next to each other. I have no color scheme. I don’t have time to figure that out. my scrappy quilts are for charity so where the finished quilt goes, it is very much appreciated, no matter what. I’m making a scrap quilt with anything goes fabrics. I’m hoping that this modified log cabin’s pieces are small enough to work together. I’d like to have my scraps sorted but seem to enjoy working with new purchases rather than twking the time to sort. I pick a color or two and go with it. I usually make scrappy quilts in bright colors, anything goes.